Natural Landscapes (Cambridge) Limited was formed in 2003 and has been providing exceptional service to their clients for over 8 years. The team is headed by the company director Marcus Carlton who has over 16 years landscaping experience, in all aspects of garden design and construction. Our landscaping team have a wealth of knowledge to deal with any enquiries and advice you may require. 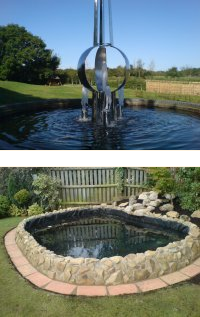 We undertake all aspects of garden design, construction and maintenance and also have good contacts within the industry for any other services you may require. Decking- small or large decking projects can be undertaken. Turfing- lawns laid using high quality locally grown turf. Fencing-all styles of fencing erected. Driveways- Can be constructed using a range of different materials. All aspects of aquatic features constructed. Timber structures including pergolas and archways. We aim to use local products available from local businesses sourced from sustainable resources.Here at Natural Landscapes we provide a whole range of services to help you to create your perfect outdoor area. We can design the ideal space then we will build it using the highest quality materials with all your requirements in mind. We also take on the regular maintenance which includes weeding, grass cutting, pruning at domestic properties. We also offer a maintenance package for commercial sites based on an annual contract. The design process starts with a free no obligation site visit where we will discuss with you your ideas and requirements. We would then measure the area in question and if required we would go away and design the space on paper to scale.